to "Med" or "Max", a number of powerful extensions are added to the basic calculator. If – in W/PRGM mode on a real HP-67 – you press GTO.2, then keys A and D simultaneously, the code 32 24 is entered. This command doesn't do anything, but executes in a mere 7 ms. It's therefore a perfect substitution for the missing NOP command. On RPN-67, you simply press g (i) to enter the command. On RPN-97, press EXT 0 (you will have to exit vintage mode temporarily). The keycode is 71-61. On RPN-97, you can delete any number of program memory steps in a single operation. 1. Enter the first and the last step to delete in x and y. 2. Switch to PRGM mode. 3. Press EXT 1 to delete the steps. If the range is illegal, the command is ignored. Most new functions may be accessed by executing OP (RPN-67: g OP, RPN-97: EXT OP). Some are mapped to existing keys and show up after tapping g or h (RPN-97: EXT). Almost all extended functions are programmable. Calls up the table of Constants and Conversions (see below). When followed by a register address, exchanges x with the value contained in the register. Calls up the table of Operations (see below). Adds the number of days represented by the integer part of the value in X to the date in Y. If Y = 0 and X is in the range 1583 – 4099, the Easter date of the year in X is shown. Add 49 to the Easter date (49 DAT+) to get the date of Pentecost. Calculates the number of days between the date in Y and the date in X. The result is positive if Y is the earlier date. A negative value indicates a Julian calendar date. A negative date is treated as Julian calendar date. Returns the the current date, formatted as mm.ddyyyy. The range is Jan 1, 0001 through Dec 31, 9999. Dates before Oct 15, 1582 are Julian and are shown as negative dates. Negative date inputs are treated as Julian dates. Time format is hh.mmss, where hh is in 24-hour format. Turns complex mode on and off. The current status is shown in the display. Basic operations work on x,y (real,im) and z,t (re,im). Complex numbers may be stored in registers R0...R9, with the imaginary part occupying registers R10...R19. Registers A...E act on the real part only. Certain extended functions, e.g. Γ(x), will return complex results in complex mode. Executes the hyperbolic variant of the next operation (if applicable), e.g. sinh instead of sin. May be used for hyperbolic polar/rect conversions. Creates a random number between 0 and 1 (exclusive). Stores the stack registers X, Y, Z and T on an internal 4-level stack ("stack-of-stacks"). Retrieves the stack registers X, Y, Z and T from the internal 4-level stack. Clears registers X, Y, Z and T if the stack is empty. The previous x-value is saved in LastX. PUSH and POP allow preserving the stack between subroutine calls. RPN-67/97 Pro features improved register arithmetic functions and adds one hundred storage registers. the basic operator keys (+,–,..) whenever appropriate. STO.Z copies the value in X to z.
RCL–.Y subtracts y from x. The functions STO+0, STO-0 etc. for registers 0...9, A...E, and (i) also work with RCL operations. For registers 0...9, all functions also work in complex mode. In addition, the ∑+ key may be used as a register address, working between X and RS14 and between Y and RS16 simultaneously. STO.nn and RCL.nn (where nn = 00 through 99). STO. (i) and RCL. (i) will use the value in register I as register address. Full register arithmetic is supported. All operations involving (i) will automatically use extended registers if the value of i exceeds 25. 15 new operations are available for working on any range of extended registers. Extended registers are saved on data cards. They may be printed out by setting the paper tape printer to TRACE mode and executing REG. STO ENTER ("STO STK") copies the registers to the extended registers. RCL ENTER ("RCL STK") retrieves the registers from the extended registers. ≷ ENTER ("XCH STK") exchanges the registers with the extended registers. With 100 additional labels at your disposal, you'll never run out of labels in your programs again. Use two-digit labels in the same way you use the regular single-digit labels by simply inserting a "+" between the command and the label number. For example, LBL+37 defines label 37. GTO+37 branches to label 37. GSB+37 calls the subroutine at label 37. Indirect addressing by using the I-register is supported, too. The positive integer part of register I is used as label number. If the absolute value of I is larger or equal to 100, an error will occur. For even more flexibility, you can use the additional indirection registers J and K for GTO and GSB commands. See the Extra Functions 90..95 (below) for details. NOTE: You can print all labels used in a program and their locations by executing the SYS/INFO operation with argument 10. If LBL 99 is defined in a program, it will automatically execute on loading the program. This feature may be used to initialize a program without user intervention. Loading an auto-executing card will briefly flash a message in the display. Tap the green text to scroll LBL 99 into view in the listing. RPN-67/97 adds handy toggle commands to the flag operations. All commands are invoked by the prefix key DSP. They are available to the regular flags F0…F3, as well as to the extended flags F4…F9. To use a constant or conversion: tap it, then tap "Select". Or simply double-tap the key. SI units are used, except where not applicable. Physical constants reflect CODATA internationally recommended 2014 values. Get conversion value, then multiply. Get conversion value, then divide. To use an operation: tap it, then tap "Select". Or simply double-tap the operation. All operations, with the exception of NUM CPRS, are programmable. If "Cplx" appears in the top-right corner, the function can handle complex arguments. No operation. Useful in testing and debugging programs. For an alternative, see note at the top about the "secret" NOP command. Returns 0 if complex mode is off, 1 otherwise. Stops program and displays "Error" message. Sets maximum number of programs steps according to x: 1 = 224, 2 = 448, 3 = 999. Returns current setting for any other value of x, e.g. 0. Same as "Number of Program Steps" in settings. Returns the lesser of x and y in X, the greater in Y. Returns the greater of x and y in X, the lesser in Y. Returns 0 if absolute value of x is less than 5E-10. Useful for eliminating floating-point representation errors. Modulo function: returns the remainder of y divided by x. Returns the conjugate of complex number x + iy. May be used to change the sign of y directly. Solves the cubic equation ax³ + bx² + cx + d = 0. Arguments: a in T, b in Z, c in Y, d in X. Returns the value of the Gamma function Γ(x). Works in complex mode. Γ(10) = 362880 (= 9!). Γ(-2.33) = -1.32. Calculates the linear regression y = ax + b. x,y pairs are entered using the ∑+ key. LIN REG: return in X the linear estimate for y, given an x value in X. Returns correlation coefficient in Y.
LIN REG: return in X the linear estimate for x, given a y value in X.
Inputs: z = p (success probability in each experiment), y = r (number of failures until experiment is stopped). To verify the example "Selling candy" at the bottom of this Wiki page, enter p = 0.4, r = 5, x = n-5. Calculates weighted mean (in X) and standard deviation s (in Y) of grouped data. Skewness γ1, Excess Kurtosis γ2 and Moments mi for grouped and ungrouped data. Input: Use ∑+ with value in X, weight in Y (set to 1 if ungrouped data). Returns the value of the error function erf(x) in X, the value of the complementary error function erfc(x) in Y. Store primary registers R0...R9 in extended registers starting at R.x (x = 0...99). Load primary registers R0...R9 from extended registers starting at R.x (x = 0...99). Exchange primary registers R0...R9 with extended registers starting at R.x (x = 0...99). Set all elements of 3x3 matrix [R1..R9] to x. Use with MAT ADD to add a value to all elements of matrix [R.91...R.99]. Add x to all elements of 3x3 matrix [R1..R9]. Multiply all elements of 3x3 matrix [R1..R9] by x. Adds 3x3 matrix [R.91..R.99] to [R1..R9]. Subtracts 3x3 matrix [R.91..R.99] from [R1..R9]. Transposes the 3x3 matrix [R1...R9]. Returns the determinant of the 3x3 matrix [R1...R9]. Inverts the 3x3 matrix [R1...R9]. Returns in x,y,z the Eigenvalues of the 3x3 matrix [R1...R9]. If t = 1, two Eigenvalues are complex: y + iz, y - iz. CHOP is applied automatically to the results. Stores the 3x3 matrix [R1...R9] at extended registers [R.91...R.99]. Retrieves the 3x3 matrix [R1...R9] from extended registers [R.91...R.99]. Returns in X the mean and in Y the standard deviation of all numbers in extended registers R.x..R.y. Change absolute values less than 5E-10 in extended registers R.x..R.y to 0. Copies extended registers range R.y...R.z to R.x. Fills extended registers range R.y...R.z with x. Returns in x the first register number containing x in extended registers range R.y...R.z (-1 if not found). Returns in y the number of occurrences of x in the range. Returns in x the first register number not containing x in extended registers range R.y...R.z (-1 if all registers contain x). Returns in y the number of occurrences of values different from x in the range. Returns in x the smallest value in extended registers range R.x...R.y, returns in y the register number. Returns in x the largest value in extended registers range R.x...R.y, returns in y the register number. Prints the values in extended registers range R.x...R.y on paper tape. If the first register number is a multiple of 10, then registers are printed in groups of 10, separated by a blank line. Fills extended registers range R.x...R.y with random numbers between 0 and 1. Removes duplicate values in extended registers range R.x...R.y. Returns in x,y the range containing all unique values. Reverses the order of values in extended registers range R.x...R.y. Sorts the values in extended register range R.x...R.y in ascending order. If z = -1, sorts in descending order. Returns the sum of all values in extended registers range R.x...R.y. Prints a "+" at position x on paper tape (x = 0...20). Prints empty line if x is out of range. Prints up to four characters on paper tape, starting at position x (x = 0...20). Characters are stored as decimal ASCII codes (reduced by 32) in the fractional part of x. Print up to 21 characters stored in extended registers R.x...R.x+6. Format: d.aaabbbccc, 0.aaabbbccc, 0.aaabbbccc etc., where aaa, bbb, ccc = decimal ASCII codes (0 ends string). Text alignment: left if d < 0, center if d = 0, right if d > 0. d must be single-digit. To easily create the required values, use the built-in TEXT Helper utility (see below). To print text and a result on the same line, see Extra Function 25 (below). To print "RPN-67 for iPad" centered, store these values in registers 90...95: 0.082080078, 0.045054055, 0.032102111, 0.114032105, 0.080097100, 0. Set x = 90, execute TEXT. Change the integer part of R.90 for different alignments. Prints the fractional part of x as an integer. The number of digits is defined by the DSP setting. Leading zeros are added if necessary. The sign of x is preserved. Turns printer power OFF or ON according to x.
m: 1 = MAN, 2 = TRACE, 3 = NORM. If m is negative, negative results are printed in red. m: 1 = FIX, 2 = SCI, 3 = ENG. If m = -1, don't show thousands separators. Sets trigonometric mode according to x: 1 = DEG, 2 = RAD, 3 = GRD. Returns current trigonometric mode for any other value of x, e.g. 0. Clears flags 4 through 9. To clear all flags, use extended function CLR Flags (#–2). Inserts a new roll of paper..
Returns sunrise (in X), sunset (in Y), sun transit (noon) (in Z), and altitude of the sun (in T) for a given location, date and time. Note: SOLAR accepts additional parameters and returns much more information - see box below. Get sun position data for Salem, OR, on Nov 30, 2013, 12 a.m.
Longitude is 123° 2' W,	latitude is 44° 56' N,. Time zone is UTC minus 8. 10: Prints the locations of all labels in the current program, as well as the status of flags F0...F9. Returns in x the number of unused labels. 11: Same as 10 with printout suppressed. 20: Prints breakpoints information. Returns in x the number of stored breakpoints. 21: Same as 20 with printout suppressed. 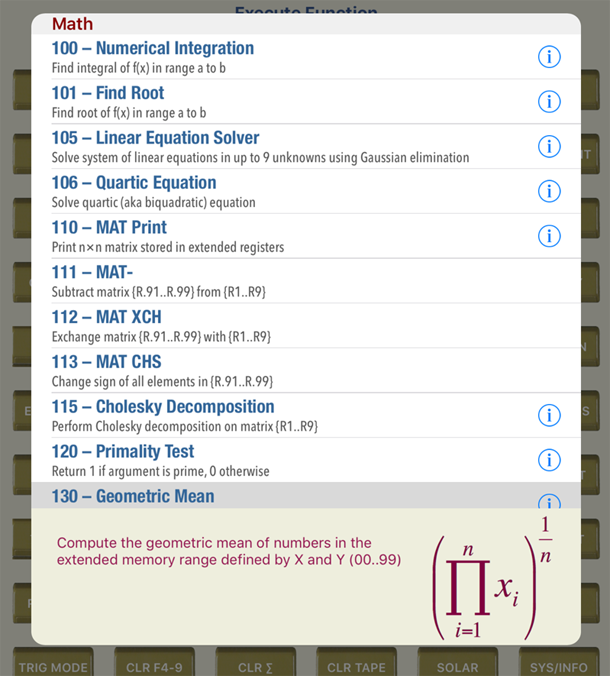 30: Prints and returns in x the number of free program steps. 31: Same as 30 with printout suppressed. If supported by the device, R.09 holds the compass heading (in degrees). If flag F9 is set, geo data is invalid or not ready yet. You can let your program repeat the command until F9 is cleared. 90: Prints and returns in x the battery level (in %). 91: Same as 90 with printout suppressed. 98: Prints and returns in x the version number of RPN-67/97. The exponent shows the calculator type (67 or 97.) Tip: use EXP/MANT to separate the values. 99: Same as 98 with printout suppressed. 100: Turn turbo mode off. 101: Turn turbo mode 1 on. This will suppress display and register updates while the program is running. Very useful for expediting time-consuming calculations. A red flash symbol in the display indicates that turbo mode is enabled. It turns green while the program is running. Output is not suppressed for printing or while pausing. Turbo mode ends automatically when program execution is stopped. x = 0: Uncompress memory by storing numbers in one step per digit. x = 1: Compress program memory by storing numbers in a single step. In PRGM mode, go to step 10 and enter 1 2 3. Step 11 now contains 1, step 12 contains 2, step 13 contains 3. In RUN mode, enter 1 and execute NUM CPRS. Step 11 now contains the entire number 123. Execute currently defined extra function. Long-press to see available functions. Extra functions are accessed indirectly by storing their function number first, then executing EXEC FN. Tap the info button to get additional information about a function. To dismiss the info, tap the info text, or any function. does not have to immediately follow STO FN. Tap "Cancel" to return to the Operations screen without changes. NOTE: Examples assume that the function number has already been stored using STO FN. To execute a function in interactive mode, long-press the EXEC FN key, then double-tap the function. there's no need to open the list of functions. Simply double-tap the EXEC FN key. Plays a short alert sound, defined by x (0..19). Values outside this range will produce the standard beep sound. x = 3 produces a series of three beeps. x = 15 creates a pleasing sequence of piano tones. Merging a card on a real HP-67/97 could be automated by placing the card into the slot without pushing it in. A soon as the sequence MERGE PAUSE was executed, the card would be pulled in, its code replacing everything after the PAUSE command. The program would then continue at the first step of the merged card. will wait for the user to load the card before continuing automatically. The loop alerts the user by a triple-beep sound to act, issued as many times as specified by this command. If no card is provided by the user within 3 minutes, the merge command will be aborted. A red bar is shown, indicating the time left until time-out occurs. If the sound is suppressed by setting its repeat number to 0, no time-out will occur. Note that the acoustic alert also works in vintage mode (available on the iPad), although the repeat number has to be defined in Enhanced Mode. For a sophisticated program involving two merge operations, see the program SIN or COS to 105 Places in the Math section of Library U. Sets extended registers R.00..R.99 to 0. Sets stack registers X, Y, Z, T to 0. Sets registers A, B, C, D, E to 0. Puts registers A..E on an internal 4-level stack. If the stack is full, the oldest register set is lost. Retrieves registers A..E from the internal 4-level stack. Reverses the order of stack registers X, Y, Z, T.
Copies primary registers to secondary registers (R0..R9 ➞ RS0..RS9). Copies secondary to primary registers (RS0..RS9 ➞ R0..R9). Separates x into integer and fractional part. Displays the positive overflow value 9.999999999 99 and lights the +∞ infinity symbol. If executed from a running program, it will be halted. Displays the negative overflow value -9.999999999 99 and lights the -∞ infinity symbol. If executed from a running program, it will be halted. T-statistics, skewness, and kurtosis to the stack. Swaps primary and non-statistical registers (R0..R3). Exchanges R0..R3 with RS0..RS3. Swaps primary and statistical registers (R4..R9). Exchanges R4..R9 with RS4..RS9. Copies stack and registers A..E to extended registers R.00..R.08. Retrieves stack and registers A..E from extended registers R.00..R.08. Puts primary registers R0..R9 and secondary registers RS0..RS9 on an internal 4-level stack. Retrieves registers R0..R9 and secondary registers RS0..RS9 from the internal 4-level stack. Prints the localized date on the paper tape (right-justified). 10.231956 EXEC FN → 1956. október 23. Prints the localized time on the paper tape (right-justified). x = time (hh.mmss). If invalid, the current time is used. Prints the localized name of the day of week of the given date on the paper tape (right-justified). x = date (mm.ddyyyy). If invalid, the current date is used. Use negative date for Julian calendar. Prints the name of the device the app is running on. Prints the iOS version number. Prepends the next line to be printed with pre-defined text. Same as Print Inline Text 1, but with the result indicator " ***" suppressed, providing more space for the user text. Loads the data card named zDATAx, where x is any integer between 0 and 1,000,000 (sign and fractional digits ignored). All data on the card gets loaded, i.e. primary and secondary registers as well as extended registers 00..99. The card number is saved in LastX. If embedded in an auto-executing subroutine (LBL 99), registers may be preloaded without using program code and without user intervention. would auto-load all registers from the data card zDATA123. 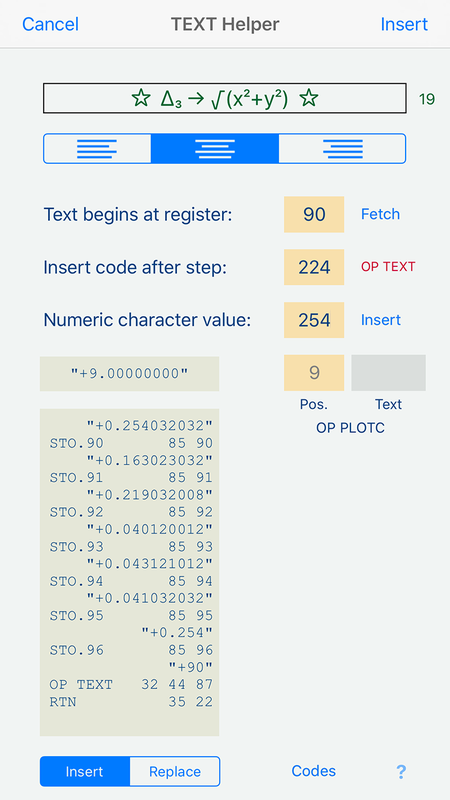 (Note: How to enter values like "+123" is shown in OP 98 above). Loads only the extended registers from the data card named zDATAx (where x is any integer between 0 and 1,000,000, sign and fractional digits ignored). Stack registers Y and Z contain the range of registers to load. Each value is automatically limited to the range 0..99. Stack register T may specifiy the register to receive the first value of the range. If invalid, the range will be stored at the original location. would load registers R.75..R.85 from the data card zDATA123 beginning at R.20. Stores all registers on the data card(s) named zDATAx (where x is any integer between 0 and 1,000,000, sign and fractional digits ignored). would create (or update) the data card zDATA123. x must be set to 666, otherwise the command is ignored. would delete all unprotected data cards beginning with zDATA. would delete the unprotected data cards named zDATA123. y must be in the range 1..100.
zDATA146, leaving protected cards intact. If the card does not exist, the program stops and "zDATAx missing" is printed on the paper tape. would return –2 if no data card named zDATA796314 exists. "zDATA796314 missing" would be printed, and the program would stop. If three cards of this name were found, the value 3 would be returned. (Note: How to enter values like "+796314" is shown in OP 98 above). – The message "zDATAx missing" is only printed in print modes NORM and TRACE. 3 = program code This command is ignored on RPN-67. Then, after setting j, simply use GTO 90 to branch to label j. Calls the subroutine at the label stored in J (where 0 ≤ j ≤ 99). To use GSB (j) without affecting the stack, use the same auxiliary subroutine as shown above. Then, after setting j, simply use GSB 90 to call subroutine j. Stores the positive integer part of x in the indirection register J. Values equal or larger than 100 are ignored. Recalls the indirection register J value to x. Increases the value of the indirection register J by one. Ignored if j = 99. Decreases the value of the indirection register J by one. Ignored if j = 0. Then, after setting k, simply use GTO 91 to branch to label k.
Calls the subroutine at the label stored in K (where 0 ≤ k ≤ 99). To use GSB (k) without affecting the stack, use the same auxiliary subroutine as shown above. Then, after setting k, simply use GSB 91 to call subroutine k.
Stores the positive integer part of x in the indirection register K.
Recalls the indirection register K value to x. Increases the value of the indirection register K by one. Ignored if k = 99. Decreases the value of the indirection register K by one. Ignored if k = 0. Turns sound on loading auto-executing program card off or on. Retrieves the currently set pause length (in secs). x = 1, 2, or 5 (seconds). Other values are ignored. Retrieves the currently set sound volume (any value between 0 and 1). x = any value between 0 and 1. Values outside this range are ignored. Stores the current display mode, trig mode, DP character, and group separator. Restores the saved display mode, trig mode, DP char, and group separator. Ignored if no settings have been saved beforehand. Finds value of integrating a function f(x) over a given range. The function f(x) may expect the stack to be filled with x. Switch back to RUN mode. Selects the accuracy of the Numerical Integration function, trading precision with speed of execution. In most cases, the setting "Normal" will produce results with at least display precision. Finds roots of a function f(x) in a given range. If no root can be found, 0 is returned and flag F9 is set. If F9 is cleared, 0 is a solution. Finds solution of a first-order ordinary differential equation by applying the explicit fourth-order Runge-Kutta method. In other words, the method finds function values of y(x) where only the slope (derivative) y'(x) at any point (x,y) is defined by a function f(x,y), but y(x) is unknown. Since an infinite number of functions meet this requirement, a starting point (x0,y0) satisfying y0 = y(x0) has to be given. By taking into account the slope y' = f(x,y) at this point, then increasing x by an increment h, successive points of y(x) are found. The calculation ends when x0 + n × increment (n integer) exceeds the desired x value. The user-supplied function f(x,y) determining the slope at (x,y) may expect the stack to be preset with x,y in X,Y as well as in Z,T. y' = y has an exact solution: y = ex + C (C = any constant). By choosing the starting point (0,e0=1), we should get the function y(x) = ex and thus y(1) = e = 2.71828. Since y' = y, the function f(x,y) for calculating the slope simply has to return y. The slope of y = ex at (1,e) is e.
Finds solution of a second-order ordinary differential equation by applying the explicit fourth-order Runge-Kutta method. In other words, the method finds function values of y(x) where only the second derivative y"(x) at any point (x,y) is defined by a function f(x,y,y'), but y(x) is unknown. Since an infinite number of functions meet this requirement, a starting point (x0,y0,y0') satisfying y0 = y(x0) and y0' = y'(x0) has to be given. By taking into account the second derivative y" = f(x,y,y') at this point, then increasing x by an increment h, successive points of y(x) are found. The calculation ends when x0 + n × increment (n integer) exceeds the desired x value. The user-supplied function f(x,y,y') determining the second derivative at (x,y) may expect the stack to be preset with x,y,y' in X,Y,Z, respectively. Finds all solutions of the equation ax4 + bx3 + cx2 + dx + e = 0. Input: a..e ➞ registers A..E.
then each row of the matrix is printed as a block of numbers. The last number in each block is the b value. This operation replaces the original matrix A by a unique triangular matrix L, called the Cholesky factor, such that A = LLT (LT = transpose of L). Tests if the integer in x is prime. The largest prime handled reliably is 2,038,074,743. Returns x = 1 if the value is prime, 0 otherwise. 78901 is prime, 78907 is not. Returns the number of 1's in the binary representation of x. Also known as the Hamming weight of the binary number. If x is negative, the 1's of the 2's-complement of x are counted, including the sign bit. In this case, x is treated as a 64-bit number. Geometric mean of all numbers in range of extended registers. x = begin of range in extended registers, y = end of range in extended registers. Returns x = geometric mean What is the geometric mean of 2, 3.4, 3.41, 7, 11, 23? Harmonic mean of all numbers in range of extended registers. Returns x = harmonic mean What is the harmonic mean of 2, 3.4, 3.41, 7, 11, 23? Arithmetic-geometric mean M(x,y), or agm(x,y). Returns the Lambert W function value of x. If x = W(arg) then arg = x·ex. Overflow if x < –118.289468. Overflow if n > 117. Calculates properties of the truncated circular cone. For the regular cone, set top radius to zero. Calculates properties of the spherical segment. For the spherical cap, set top radius to zero. Calculates the ballistic trajectory of an object thrown at a given initial angle and initial velocity. t = time to reach highest point A ball is thrown at at angle of 65 degrees. The initial velocity is 20 m/s. Find the maximum height, the time to reach it, the height at horiz. distance = 7 m, and the distance of the landing point. See description above A ball is thrown at at angle of 65 degrees. The initial velocity is 50 ft/s. Find the maximum height, the time to reach it, the height at horiz. distance = 20 ft, and the distance of the landing point. (minimum speed needed to escape from Earth's gravitational influence) Calculate properties of a satellite 640 km above Earth. (minimum speed needed to escape from Earth's gravitational influence) Calculate properties of a synchronous satellite. t = orbital frequency (revolutions per second), in Hz Calculate the electron properties in the third orbit. To convert the energy from eV into J, select the built-in constant 01 ("e", "Elementary charge") and multiply. t = wavelength of photon emitted, in nm Calculate wavelength and energy of photon emitted when the electron drops from orbit 6 to orbit 1. Equivalent resistance of parallel resistors stored in R.x..R.y. Returns 0 if any value in the range is 0. What is the resistance of 1, 2, 3, 4, 5 Ω wired in parallel? Calculates impedances and phase shift of an series RLC circuit. R4 = resonant frequency (in Hz) Calculate values for a series RLC circuit consisting of a resistance of 12 Ω, an inductance of 0.15 H and a capacitor of 100 µF connected to a 50 Hz power supply. Calculates impedances and phase shift of a parallel RLC circuit. R4 = resonant frequency (in Hz) Calculate values for a parallel RLC circuit consisting of a resistor of 50 Ω, a coil of 20 mH and a of 5 µF capacitor connected to a 100 Hz power supply. Converts star configuration of three impedances into its equivalent triangle configuration. Real impedances: input values in R1, R2, R3. Output values replace input values. Complex impedances: input values in R1, R2, R3 (real parts) and RS1, RS2, RS3 (imaginary parts). Output values replace input values. Convert values 43.35 Ω, 1.57 Ω, 81.98 Ω, arranged in star configuration, into values for the equivalent triangle configuration. Converts triangle configuration of three impedances into its equivalent star configuration. Output values replace input values. Convert values 50+12i Ω, 75-3.1i Ω, 100+11i Ω, arranged in triangle configuration, into values for the equivalent star configuration. Note that in complex mode, PrintX prints both real and imaginary parts. Shows Julian date of a given Gregorian date. Date may be in the range Jan 1, 0001 to Dec 31, 9999. If an invalid date is given, the current date is used. Dates before Oct 5, 1582 remain unchanged. Non-existing Gregorian dates will produce an error (Oct 5, 1582 to Oct 14, 1582). x = Julian date Isaac Newton was born on Jan 4, 1643 (Gregorian calendar). What is his birthday according to the calendar in use back then? What is today's Julian date (if today = Nov 16, 2017)? Shows Gregorian date of a given Julian date. Date may be in the range Jan 1, 0001 to Oct 19, 9999.
x = Gregorian date What are the Gregorian dates of Julian dates Oct 4 and 5, 1582? What is the Gregorian date if today's date is interpreted as Julian date (assuming today = Nov 16, 2017)? Calculates the Julian day number from a given date and time. If an invalid date is given, the current date is used; an invalid time will be changed to the current time. Dates after Oct 4, 1582 are assumed to be Gregorian. y = time What is the Julian day number of July 4, 1776? To get the integer value, set time to noon. Calculates the calendar date corresponding to a given Julian day. Julian day number may be in the range 1,721,423.5 to 5,373,484.5. The fractional part denotes the deviation from noon, i.e. x.5 is 0:00 of day x+1. y = time On what date was Julian day number 2,000,000? What dates correspond to Julian day numbers 2,299,160 and 2,299,161? Converts universal time to Greenwich mean sidereal time. If an invalid date or time is given, the current value is used. t = Date (mm.ddyyyy), input date or current date if invalid What was the GMST at 14h 36m 51.67s UT on April 22nd 1980? Find the GMST at 6h 30m UT on Oct 3, 2001. Find the GMST if the UT is the current time and date. Converts Greenwich mean sidereal time to universal time. t = Date (mm.ddyyyy), input date or current date if invalid What was the UT at 4h 40m 5.23s GMST on April 22nd 1980? Find the UT at 7h 18m 8.33s UT on Oct 3, 2001. Find the UT if the GMST is the current time and date.. Calculate distance between two locations on Earth, taking into account the Earth's flattening (based on WGS-84 values). Returns: x = interest portion of the xth payment, y = rebate Calculate interest portion and rebate of the 25th payment of a 30-month loan having a finance charge of $180. Given x = decimal annual coupon rate (in %), y = annual yield to maturity (in %), z = days between purchase and maturity), calculates bond price What is the price of a 4% bond yielding 3% and maturing in 99 days? SOLAR expects parameters in all primary registers, i.e. R0...R9, and RA...RE. Results are returned on the stack and in the secondary registers (RS0...RS9). Parameters must be passed according to the table at right. Atmospheric refraction at sunrise and sunset times is assumed to be 0.5667°. -99999 signifies that no sunrise/sunset event could be found. When "Error" appears, tapping any key reveals a code # indicating the error's cause. Asterisked parameters, if invalid, will be set to a default value. SOLAR is based on The Solar Position Algorithm, Copyright © 2008-2011 Alliance for Sustainable Energy, LLC, and is used by permission. Printing text on paper tape involves converting the text to suitable number values (codes) and executing OP TEXT or OP PLOTC operations. 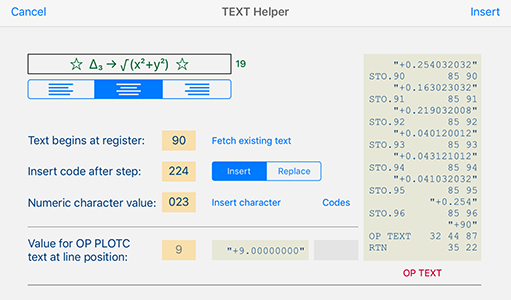 TEXT Helper is an easy-to-use tool for generating the required numbers. One register is required for every 3 characters. Enter the program step after which the generated code should be inserted. Select "Replace" to overwrite program memory instead. Tap the button in the top-right corner to store the text; otherwise, tap Cancel. Fetch existing text loads the text currently stored at the indicated location (if any) into the text field. Using the value in the X-register, PLOTC prints up to 4 characters positioned anywhere on the paper tape line. The integer part of the value defines the position (0…20). The alignment buttons may be used to insert the correct values for left, center, or right justification. You're taken to the editable program listing. Leaving TEXT Helper takes you back to the program listing where you can check and modify the changes. You can optionally add the two lines required to output the text, followed by a RTN instruction, to the text storing instructions. Tap the button to turn the lines on and off. Load and run the program "Character Set for TEXT"